The first class for the Lindy Hop series met over the weekend and got a great lesson. Attendees learned framing, positioning, basic leading and following skills, and got a sneak peek at Lindy moves such as the Shim Sham and Suzie Q’s. Classes are every Saturday through November 9 at the Laramie Recreation Center. If you’d like to sign up, call the rec center at 307-721-5269. 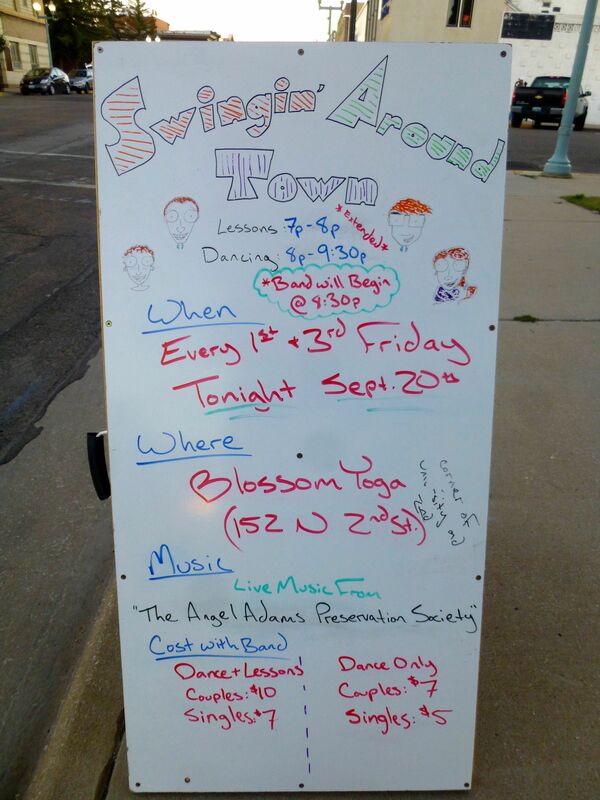 A good time was had by all at the swing dance last night with Swingin’ Around Town hosted by Blossom Yoga. The night started with an hour long lesson that reviewed the basic jitterbug, tuck turns, a tandem Charleston, and a dip. The class was taught by Charles and Jennie Fournier. The dance started off with a half hour of DJ’d music, followed by live songs played by the new local band, Angel Adam’s Preservation Society. Experienced dancers showed off their moves, while beginners had a great chance to practice what they’d learned at the lesson. A raffle was held for a gift certificates to the Copper Kettle and free entry for one couple to the next Swingin’ Around Town event. The next lesson and dance are scheduled for Friday, October 4, 2013. More information will be posted as it becomes available. If you don’t want to wait that long to start dancing, it’s not too late to sign up for the Lindy Hop series that starts this evening! Remember to come to the Swingin’ Around Town lesson and dance tomorrow, at 7:00! Tomorrow’s pre-dance lesson will be a 1920’s Swing dance style called the Charleston. For this special session, the lesson time will be extended to an hour instead of the normal half hour. For an example of some great Charleston moves, check out the video below. Instead of tomorrow’s dance being DJ’d as previously thought, a new band called The Angel Adams Preservation Society will be playing. The dance begins at 8:00 and the band is scheduled to start at 8:30. Since there is a live band, there will be an extra $2 charge for admission to the dance. Information in the Details section below has been updated to reflect the change in lesson length and pricing. Location: Blossom Yoga located at 152 N. 2nd St. in Laramie, WY. Monday I posted about a Swing lesson and dance in Laramie. Swing is an umbrella term for a style of dance that began in the 1920’s and grew more popular in the 1930’s and 1940’s. There are different kinds of Swing dance, one of which is called Lindy Hop. Lindy Hop is one of the most popular kind of Swing dance. It is very fast-paced, more difficult than the basic swing, and has infinite variations once you learn the basics of it. Click on the video below to see an example of Lindy Hop. Well then, you’re in luck! 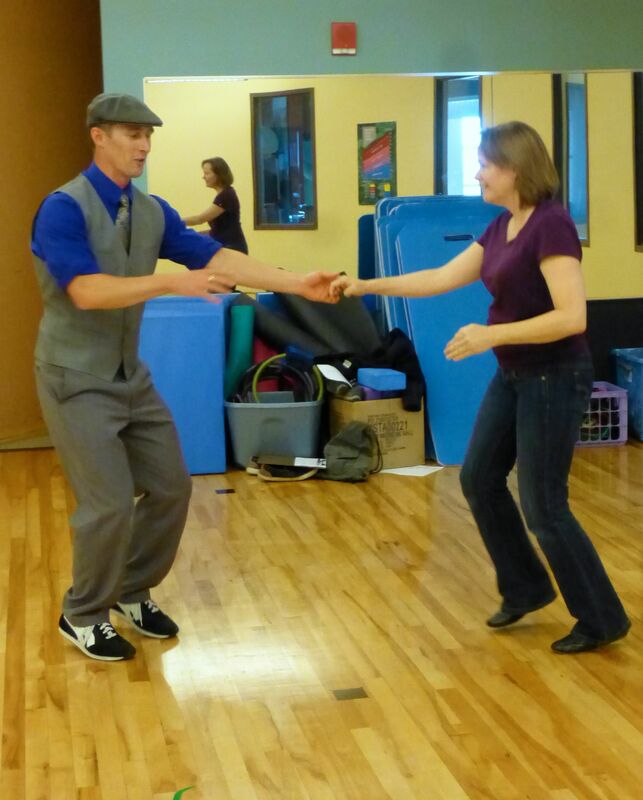 Local Lindy Hopper, Kevin Bretting, is teaching a progressive series of classes in Lindy Hop. 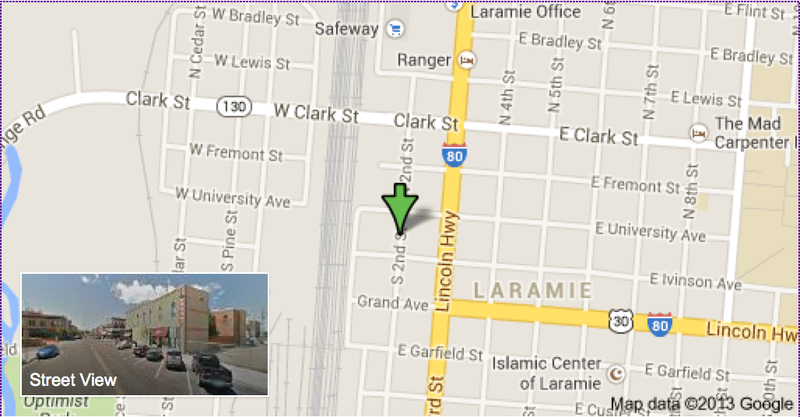 The classes are every Saturday at the Laramie Recreation Center. Kevin will begin with the basics and progress through more advanced moves, building more skills with each lesson. The classes begin this Saturday, September 21 and go through November 9th. If you’re interested in learning to Swing Dance, now is the time to get involved! Swingin’ Around Town has a lesson and dance the first and third Friday of every month, with the next lesson and dance happening this coming Friday. The night starts with a 30-minute lesson to get you started on the basics of Swing. The lesson is followed by a dance that is sometimes accompanied with a live band. Don’t have a partner? Don’t be shy – come anyway! Attendees rotate throughout the lesson and dance, so everyone has a chance to dance and meet new people. Beginning dancers are welcome. This is a friendly environment and the lessons are geared towards people who have never tried Swing Dance before. Experienced dancers won’t be bored though, as the lessons are a great opportunity to perfect your skills. *Note that $2 extra is changed on nights when there is a live band. This Friday is a DJ dance so the extra charge does not apply. Let me know if you are planning to go. I would love to meet some fellow LCCC classmates!